Tooth decay on the root surface of teeth is also called root decay or root caries. It is an important dental problem that needs immediate treatment. While many people are fortunate enough to have cavity resistant tooth enamel, few people have cavity resistant root surface. When gums recede below the enamel line of the tooth or pull away from the tooth, root surface is exposed. The root surface does not have a hard protective enamel covering like the crown of the tooth. This unprotected surface is very vulnerable to decay. Root caries do not occur unless the root of the tooth is exposed or there is loss of attachment of the gum to the tooth. An exposed root surface frequently becomes sensitive to hot, cold and sweet foods and drinks. 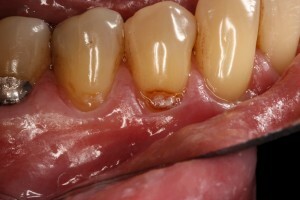 The appropriate treatment of receding gums depends on the reason for recession and the extent and severity of the decay. Use a soft bristle or electric toothbrush. Our dental hygienists teach dental patients how to brush teeth to clean tooth surfaces and gums thoroughly and prevent further gum recession. This will not repair existing damage but will hopefully prevent additional gum recession. Excellent oral hygiene at home and routine cleaning by a dental hygienist and dental examinations. If the gum recession is caused by periodontal disease, the patient will need periodontal treatment by a dental hygienist that usually starts with scaling and root planning. 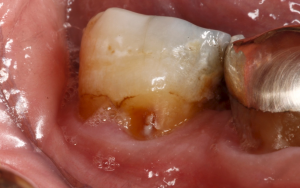 Plaque and tartar are removed from the surfaces of the root and teeth. Periodontal treatment can help gum tissues heal and reattach to the tooth surface. 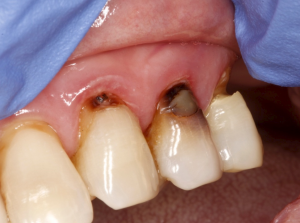 If gum recession is advanced, a gum graft where the gum tissue has receded may be indicated. Grafts may help protect the root surface from sensitivity and decay. If tooth decay or root caries are present, the patient will need to have the decay removed and replaced with a filling or crown. At McCarl Dental Group, we have not used amalgam fillings for more than 25 years. We use tooth colored composite filling material to fill a cavity after removing tooth decay. Dental fillings should not be visible when you smile or talk.